FREDERIKSTED, St Croix, USVI- The makeup of the US Virgin Islands’ 32nd Legislature — at least on St Croix — will look very similar to that of the 31st, except for one not-so-new face: Alicia “Chucky” Hansen. All except one — Kenneth L. Gittens — of the senators who currently make up the 31st Legislature in St Croix were elected today to serve new terms, and they will be joined by Mrs Hansen, a veteran senator whose storied 2014 problems stymied her chances of getting back into the Senate that year. The new order, according to VI Elections System results, sees Senator Kurt A. Vialet coming in first with a total of 5,667 votes, followed by Novelle Francis with a total 5,126. Coming in third was Mrs Hansen with a total of 4,513 votes, followed by Sammuel Sanes with 4,497. Independent Senator Terrence A. 'Positive' Nelson managed fifth place with 4,221 votes, and he was followed by Senator Nereida Rivera-O’Reilly in sixth place with a total of 4,175. In seventh place was Senator Neville A. James, who only eked out a victory by a mere 70 votes. In a conversation with The Consortium, Mr Vialet said he was humbled that voters not only chose him for a second term, but also as the top vote-getter. Mr Vialet praised his staff, who he says continues to work hard, and a committee that has been with him from the onset. And he thanked his family for being supportive throughout the process, noting that having family’s support was an important part of his success as a politician. Asked about his colleague Mr Gittens, who will most likely be out of the Senate come January, Mr Vialet expressed disappointment, but said he was confident that Mr Gittens’s skills would be utilised elsewhere in government. Perhaps in public safety, Mr Vialet suggested. He noted their friendship dating back before they became senators, and praised Mr Gittens for his work in the Senate. 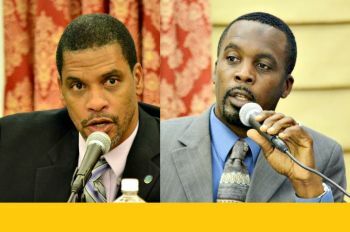 Senator Novelle Francis, coming from the same law enforcement background as Mr Gittens, said he was thankful and excited for being chosen for a second term to serve, but was “very, very disappointed,” with the outcome relative to Mr Gittens. Senator Nereida Rivera-O’Reilly expressed gratitude as well. These interviews occurred outside the Elections System offices in Sunny Isle. Mr James was not available for an interview. Neither was Mrs Hansen, whose headquarters is located in Five Corners. 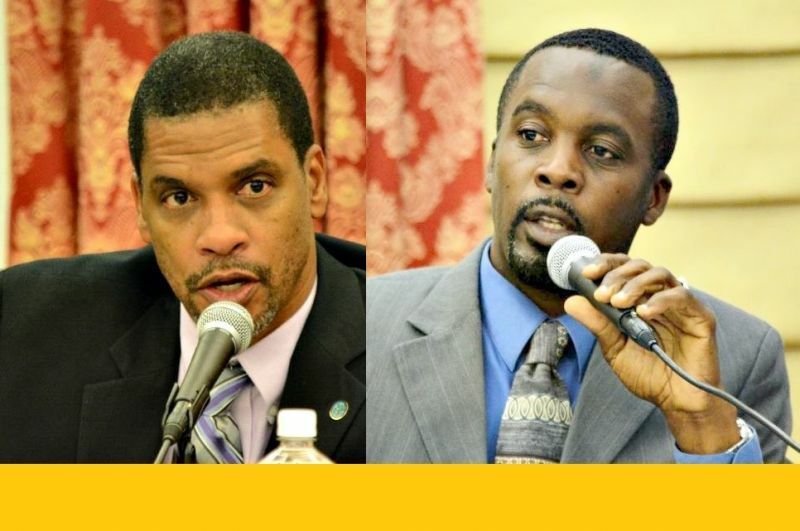 Meanwhile, Senator Marvin A. Blyden, as with Kurt Vialet in St Croix, has for the second time topped the Senate race in St Thomas, leading a pack of more than 17 candidates with a total of 6,186 votes, according to unofficial tallies from the Elections System of the Virgin Islands. Senator Janette Millin Young came in second with 5,030 votes, followed by Tregenza A. Roach — both senators have stood out by breaking ranks with their colleagues on multiple occasions, the latest being their decision not to approve a $247 million working capital debt financing measure, recently signed into law by Governor Kenneth E. Mapp. Myron Jackson came in fourth place with 4,200 votes, followed by Jean Forde with a total of 4,023 votes. Senator Justin Harrigan, Sr did not survive the race; the senator was knocked down to ninth place while two newcomers continue to battle for the seventh seat. Mr Harrigan came under fire in November 2015, after stating during a Senate hearing that senators could “take” the government’s money when hard times hit, with the intent of returning the funds. Newcomer Kevin A. Rodriguez, a Democrat, came in sixth with a total of 3,929 votes, while Dwayne Degraff, an Independent who has secured 3,631 votes, and Janelle K. Sarauw, another Independent who has so far gathered 3,592 votes, continue to battle for the seventh seat. The race is close enough that absentee ballots and walk-ins could tip the balance. The At-Large race was won unopposed by Brian A. Smith, with a total of 5,563 votes. Senator Almando Liburd, the current at-large senator, and Clifford Graham, chairman of the Committee on Finance, did not seek reelection.